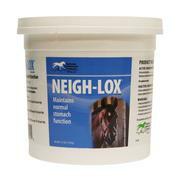 Neigh-Lox’s unique patented formula aids in the maintenance of a normal stomach environment that reduces the risk of gastric ulcers. 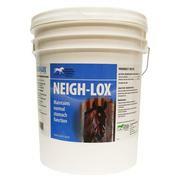 Long-acting Neigh-Lox neutralizes excess acid and coats the stomach lining for up to 8 hours. Neigh-Lox has the capacity to buffer for a long period of time (minimum 6-8 hrs); most antacids buffer for a much shorter period. In addition to its buffering capabilities, Neigh-Lox also contains compounds that coat the lining of the stomach and adhere to gastric lesions, which maintains healthy mucosa and supports healing.